matic working mechanisms of photothermal and photodynamic therapy effects exerted by Au NRs at low light doses. (a) In vivo photo-destruction of malignant tumors; and (b) Series of cellular events are involved in the PDT and PTT-induced cellular deaths upon photoexcitation of cells internalized Au NRs. 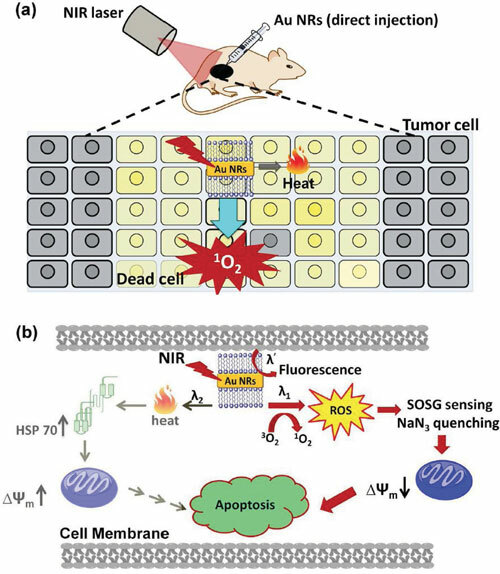 (Reprinted with permission from Wiley-VCH Verlag)Reporting their findings in Small ("First Demonstration of Gold Nanorods-Mediated Photodynamic Therapeutic Destruction of Tumors via Near Infra-Red Light Activation"), Hwang and his team have demonstrated that, upon NIR light irradiation, Au NRs can mediate PDT effects to completely destruct B16F0 melanoma tumors in mice in the absence of additional organic photosensitizers. "We show that gold nanorods can serve as a very superior multi-functional theranostic reagent" says Hwang. "Gold nanorods alone can sensitize formation of singlet oxygen and exert dramatic PDT effects on complete destruction of tumors in mice under very low LED/laser doses of single photon NIR (915 nm, <130 mW/cm2) light excitation, which are very feasible to use for deep tissue clinical PDT treatments. ""Gold nanorods are resistant to photobleaching, enzymatic degradation, and also possess a 4-6 orders higher extinction coefficient for effective light absorption than common organic photosensitizers," he continues. 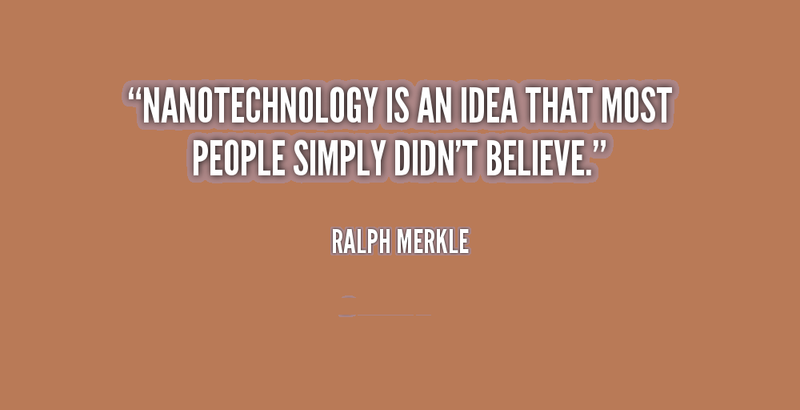 "Therefore, they are far more effective than organic photosensitizers. In addition, we also found that gold nanorods can emit single photon-induced fluorescence to illustrate their in vivo locations/distribution. "As Hwang points out, the Au NRs-mediated PDT and PTT effects can be switched from one to the other simply by choosing different photoexcitation wavelengths. "This allows us to investigate the relative contribution and efficacies of PDT and PTT effects on destruction of tumors in animal models. We used this to demonstrate, for the first time, that intrinsic Au NRs – without any fluorescent dyes – can be used as in vitro and in vivofluorescent markers in the visible to NIR region of wavelengths. "In order to bring the nanomaterial-mediated photodynamic therapy field from bench-to-bed side, Hwang suggests the following next steps:(a) Investigation of the long-term cytotoxic effects and immunological responses of gold nanorods in organisms. The immunostimulatory properties of gold nanorods, including antigenicity, adjuvant properties, inflammatory responses, and the mechanisms through which Au NRs are recognized by the immune system, need to be studied. (b) Design of new multi-functional theranostic reagents which are capable of absorbing incoming light very efficiently for diagnosis and also for production of singlet oxygen upon NIR light activation to facilitate efficient PDT effects for complete destruction of solid tumors. (c) Development of nanomaterials with extremely high molar extinction coefficients and capability of absorbing light at longer NIR wavelengths, so that deeper tissue penetration depths can facilitate effective therapeutic treatment at ultra-low laser powers, low dosage of nanomaterials, and short irradiation light time.By Michael Berger.